Books shouldn’t be allowed to end with cliff-hangers like that.An Elfy on the Loose by Barb Caffrey is part of the Elfy Duology, and as the first of a two-parter, ends at a point where you are building for a big confrontation, but it hasn’t happened yet.Of course, you wouldn’t care about what happens, if she hadn’t drawn you in. But she did draw me in.The world, or should I say worlds, that Caffrey built are a good setting for the story she places in it, of which I think only a small part is actually displayed in this first part of the duology. I kept reading to find out what happened.Which doesn’t mean that I always found the reading easy going. I tried to figure why I sometimes felt labored at reading, and yet driven to continue. I think it had something to do with the dialogue. The conversations between the two main characters were a little odd sometimes, and quite extensive at the same time. It is that don’t show, tell, concept, but backwards, that my writing professors in college always pushed.I mentioned how good Caffrey’s world construction was. That is true, but its presentation, often in the extensive dialogue sections, often had a slightly mechanical sense to it. It wasn’t quite as organic as, say, the world of Tolkien’s Middle Earth. But that isn’t a fair comparison — especially of an author’s first published work against a literary masterpiece.I expect both of these elements to smooth out and get better as Caffrey works on the second part of the duology. I hope they come out sometime. I need to KNOW what is going to happen.So go pick up a copy and learn about the Elfy world — and how the plural of elf is elfs, not elves. 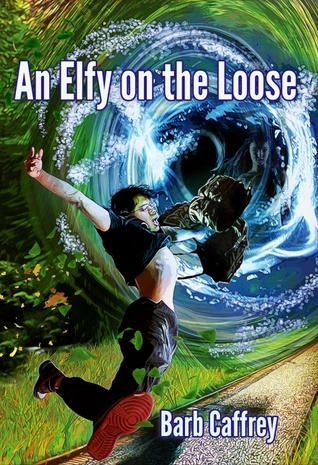 Elfy on the Loose is the first half of a duology by Barb Caffrey, so the story is not complete in this volume.It is about an excitable young Elfy (a magical race) man being sent to, and abandoned on Earth. He needs to find a way out of the mess he finds himself in, as well as rescuing his mentor, and a young human woman, trying not to get any further into trouble. Along the way, he learns that nearly everything he has learned about the human world, his own world, and even himself, is a lie.The book is alternately exciting, scary, and funny, with mysteries to be solved, and great evils to be faced and overcome.We meet quite a few characters in this book, good and evil, both human and Elfy, as well as a few ghosts, not counting the house almost seems to have a personality of its own. Two of them, possibly. As well as a couple of friendly backpacks.All in all, a satisfying read, and I'm waiting for the second half of the story to come out. Damn good book, I wish it was a bit longer and the ending was a bit of a letdown leaving me wishing the author did not end it so abruptly. the ending though is the only major issue I can take with this work. All in all this author's with will remain high on my list of works to be checked for when I finish a book and are ready for another one. Barb Caffrey - BARB CAFFREY is a writer, editor and musician from the Midwest. She is the author of the humorous urban fantasy AN ELFY ON THE LOOSE, and is the co-author of the Adventures of Joey Maverick series (with late husband Michael B. Caffrey). Previous stories and poems have appeared in BEDLAM'S EDGE, HOW BEER SAVED THE WORLD, BEARING NORTH, STARS OF DARKOVER, the Written Word online magazine, Joyful Online, the Midwest Literary Magazine, and at e-Quill Publishing. A writer, editor, and musician, Barb is also an inveterate reader, a huge baseball fan (Go, Brewers! ), reviews books at Shiny Book Review, follows politics, is mystified by the Maury show, and wonders when her little dog will ever stop doing "the paw trick." Find her at Elfyverse, Facebook, or Twitter.